E-PIC S.r.l. is a privately owned engineering consulting company, based in Turin, Italy. All the members are qualified chemical engineers with expertise in process development, innovation and troubleshooting, with process intensification techniques. 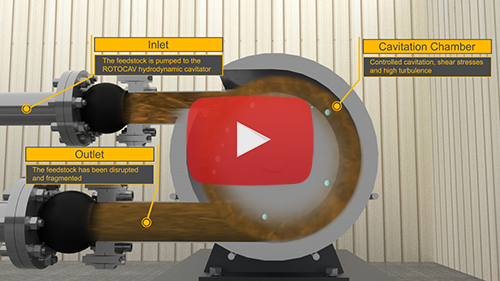 Our ROTOCAV hydrodynamic cavitator generates non-damaging and controlled cavitation, by creating sinusoidal shock waves such as in ultrasound technologies, without the limitation of its application to large flows. Hydrodynamic cavitation and shockwave power are energy-efficient and effective means to homogeneously apply high shear and intense stress to liquids or suspensions. ROTOCAV hydrodynamic cavitator can be installed for mixing, wastewater treatment, extraction of plants, homogenization, biogas and bioethanol yield enhancement, biomass treatments, scale free heating, process intensification applications and biodiesel transesterification, in food, cosmetic, nutraceutical, pharma and chemical industries. 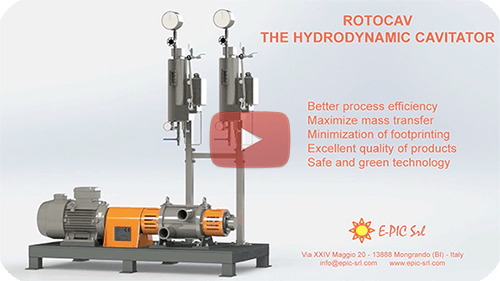 ROTOCAV hydrodynamic cavitator can homogenize any liquid/liquid, liquid/solid and liquid/gas and it can disrupt solid particles increasing total pore and micropore volumes: the spinning action of the rotor and the specially designed stator generate controlled hydrodynamic cavitation, which improves efficiencies and product quality. Our ROTOCAV hydrodynamic cavitator can be installed in-line or in loop, depending on process conditions. Hydrodynamic cavitation generated in the compact and safe ROTOCAV hydrodynamic cavitator is a green technology as it decreases treatment time and operative costs. E-PIC S.r.l. is expert in induced acoustic and hydrodynamic cavitation, process modeling, transient calculations and simulations, design and development of cavitational elements.